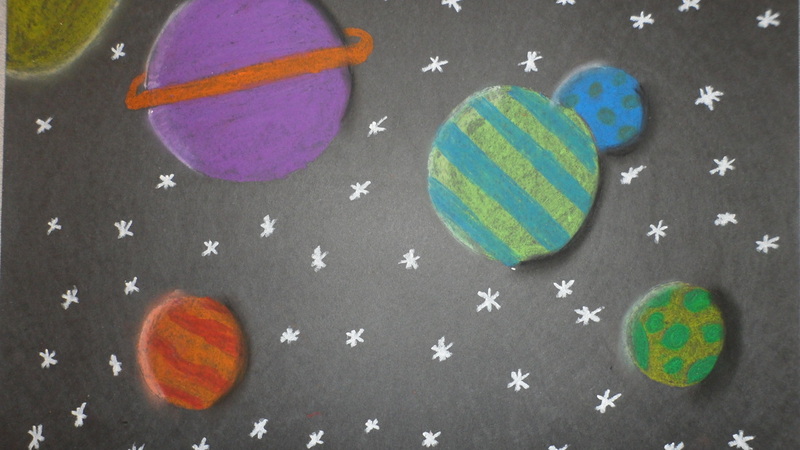 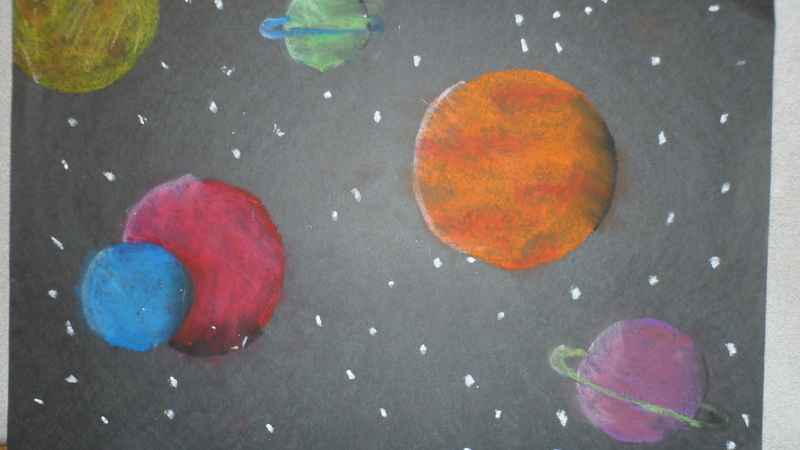 Since the 4th graders are learning about space, we decided to add some science into our art for the week. 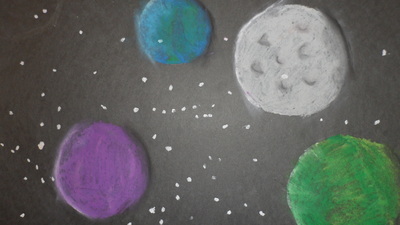 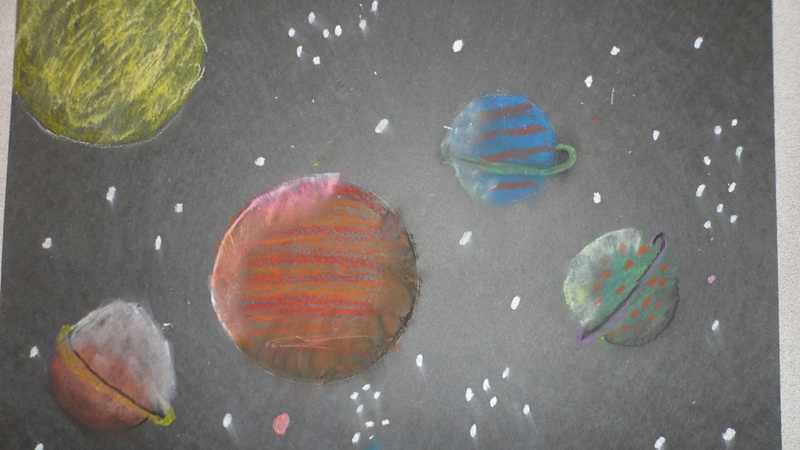 Students created their own solar system and had to choose where their light source was coming from. 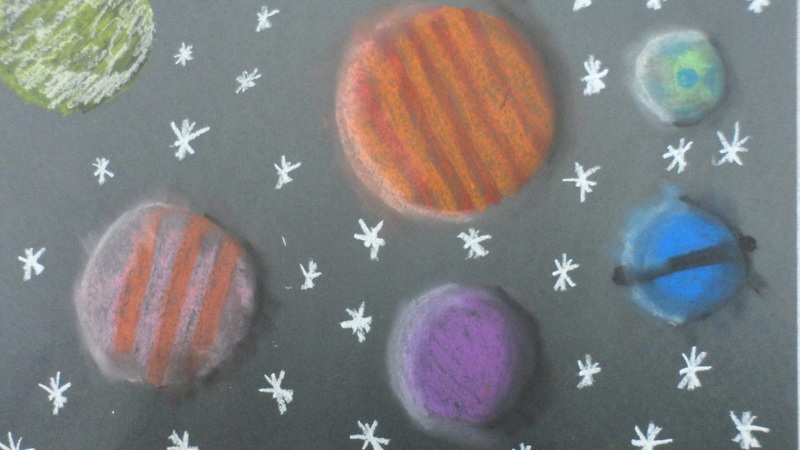 On one side of their planet they had to blend white pastel and the other side they had to blend black pastel. 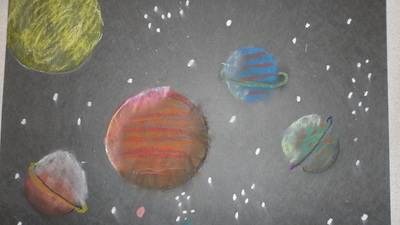 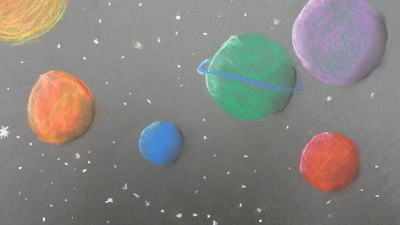 This gave their planets a 3D effect. 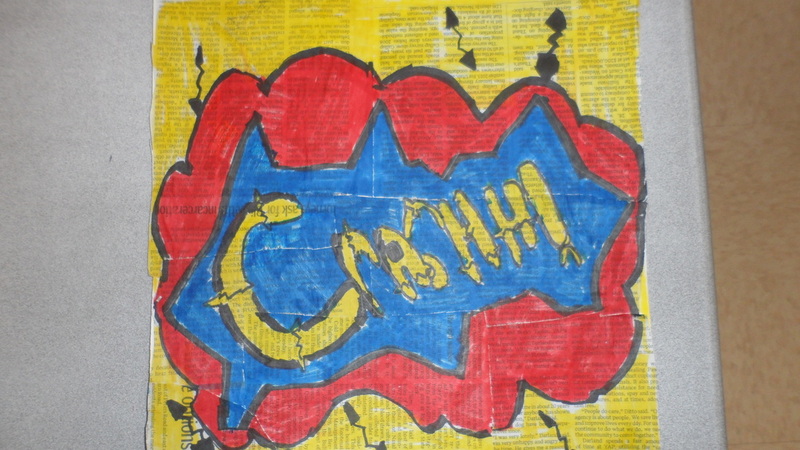 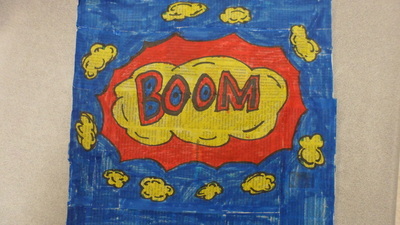 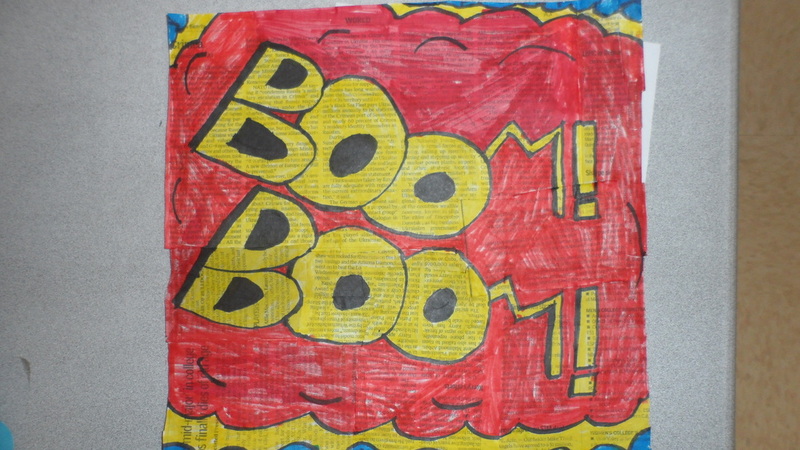 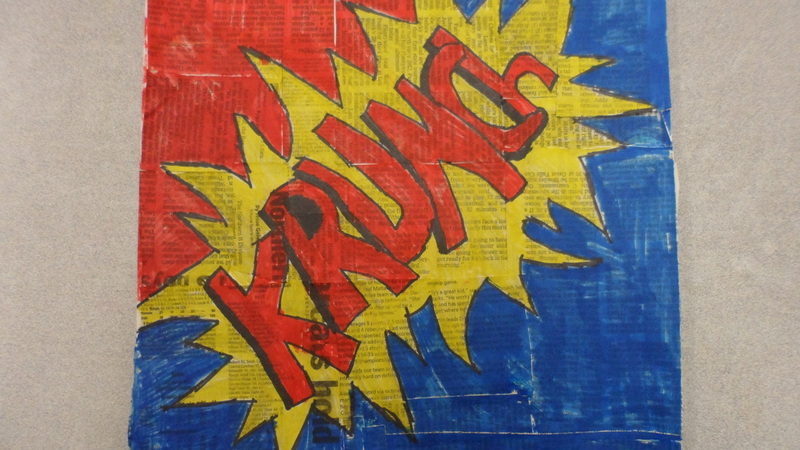 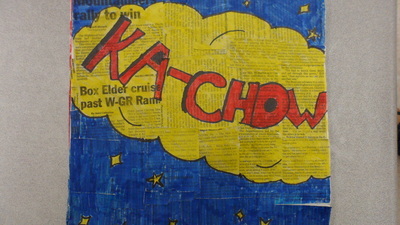 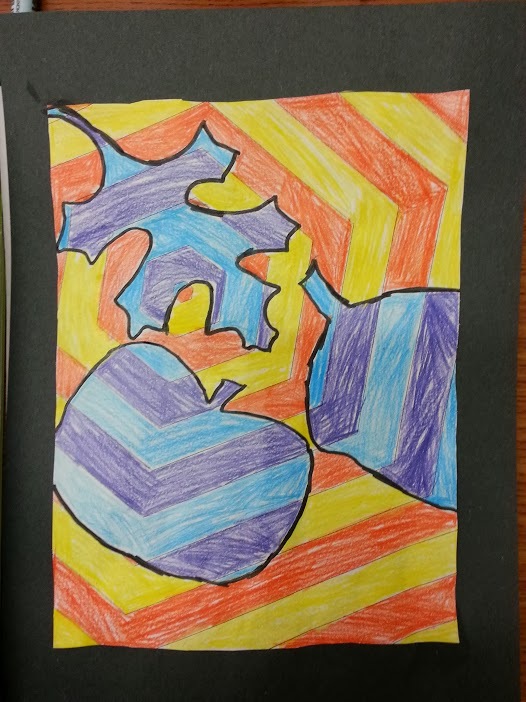 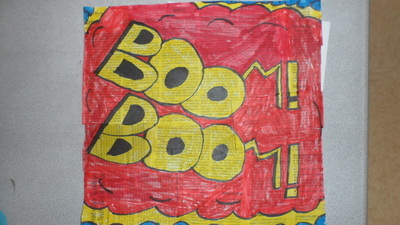 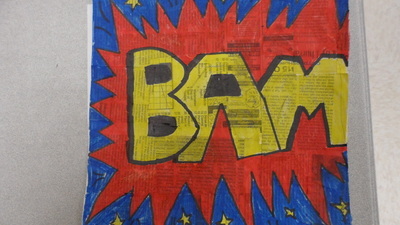 This was a 5th grade project that was inspired by pop art and the work done by Roy Lichtenstein. 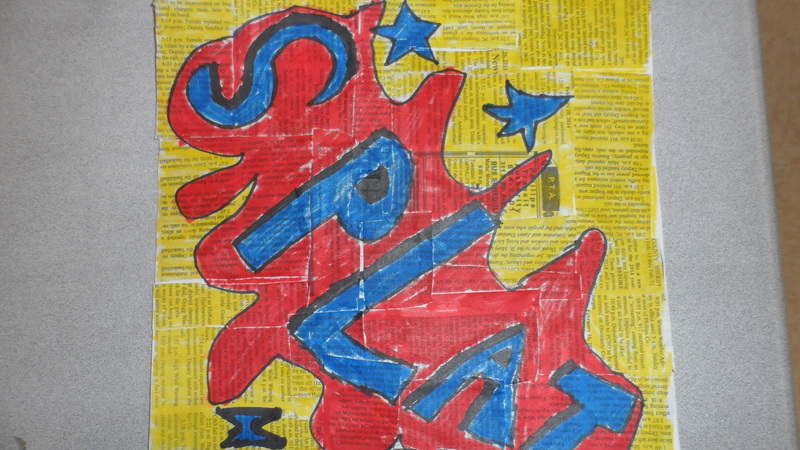 The students started by making a collage out of newspaper using only text. Then they chose a word that gave you a feel of action or emotion. 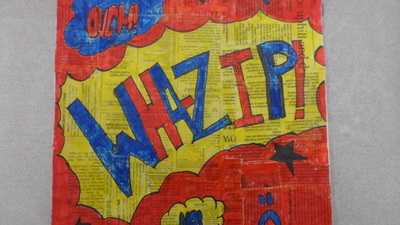 Students channeled comic books to come up with some of their words. 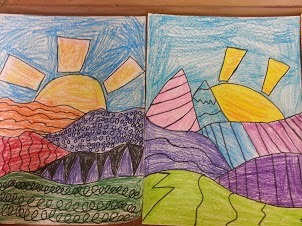 Then students were only allowed to use red, blue, and yellow markers to color in their drawings. I think they turned out great! 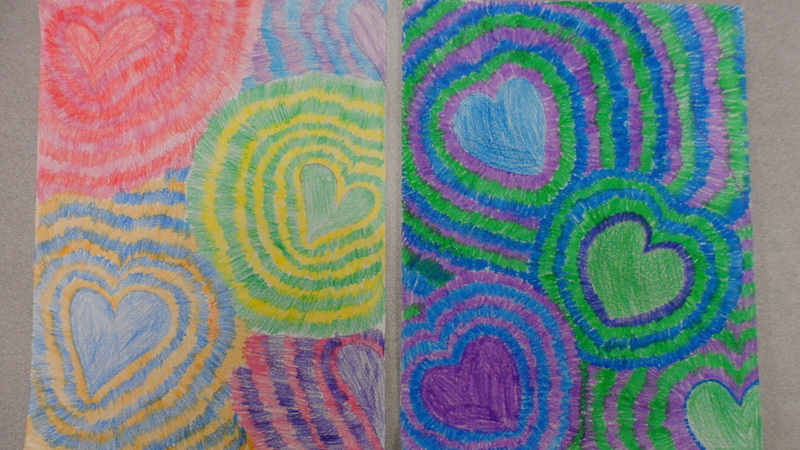 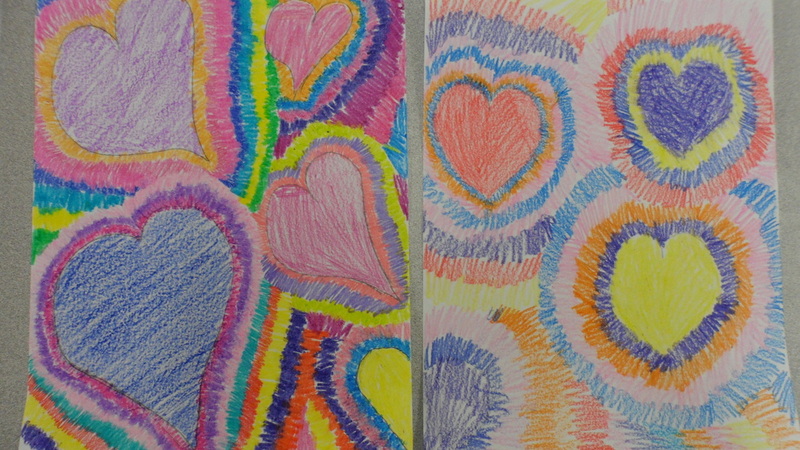 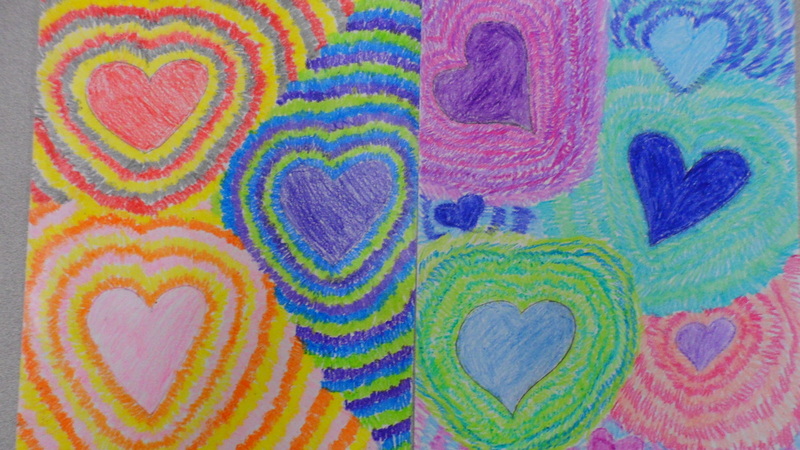 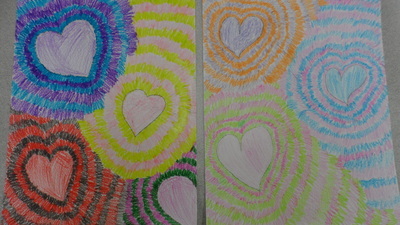 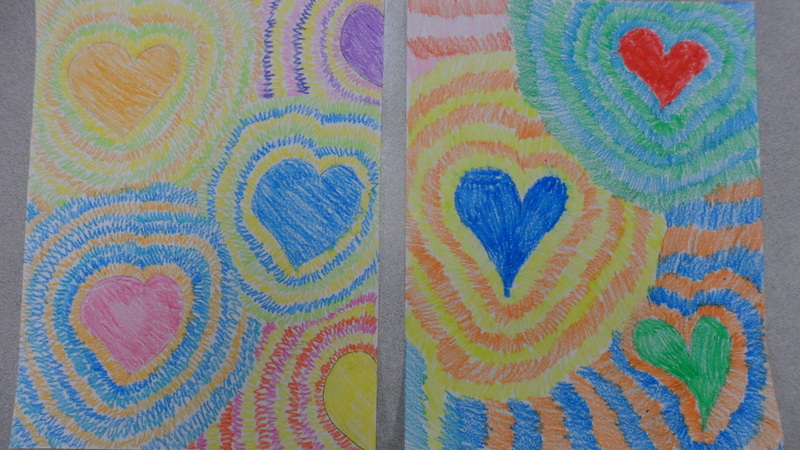 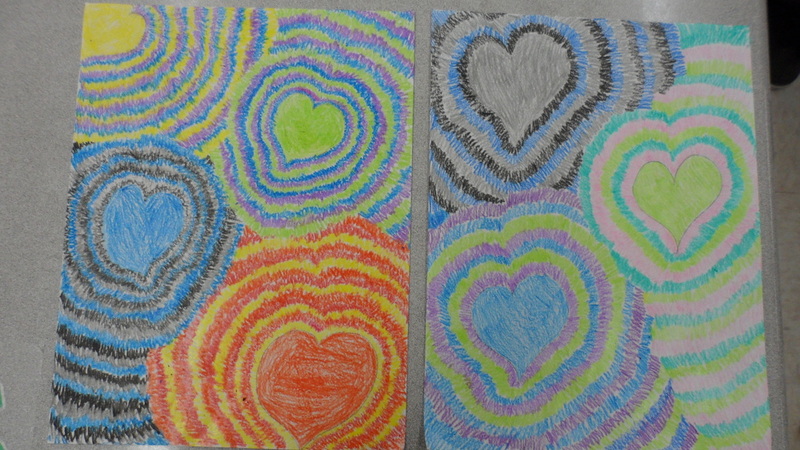 This project was for Valentine's Day and the students used either crayons or colored pencils to make the hearts look like they were radiating. Some students used a lot of detail and some students whipped through this project. 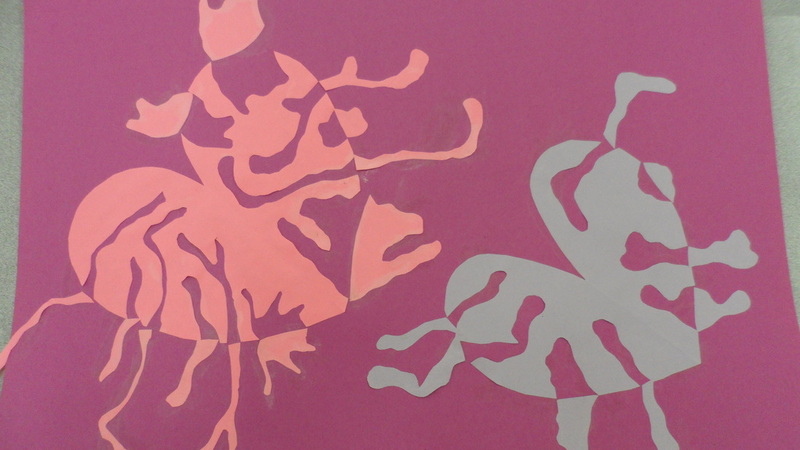 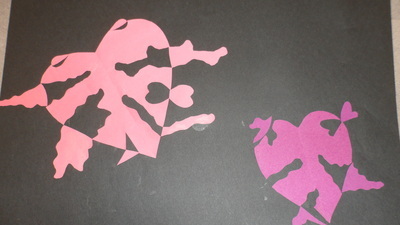 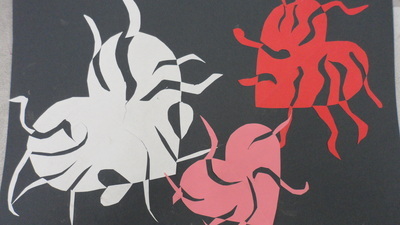 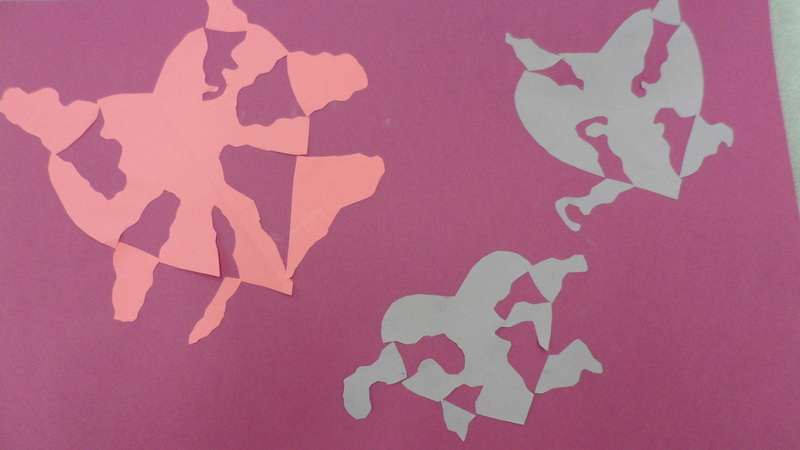 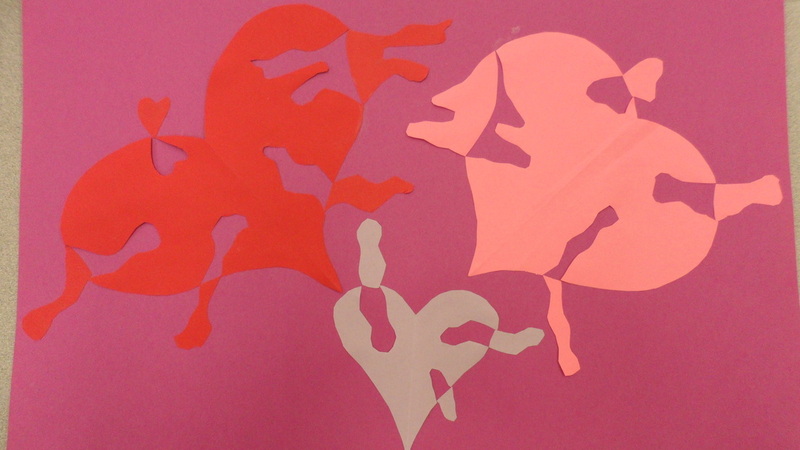 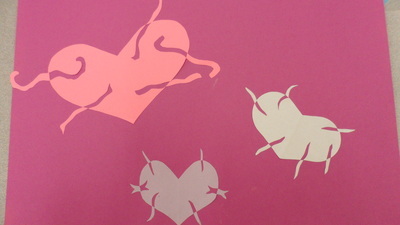 To get into the spirit of Valentines Day, we made a project focusing on positive and negative space. The students cut out hearts first and then cut pieces out of the heart and flipped the piece so it was on the outside border of the heart. 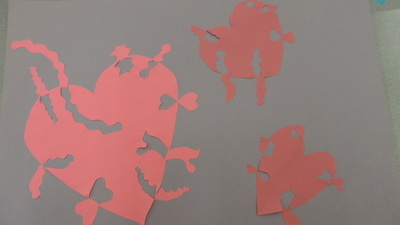 The more cuts they put into the heart, the more interesting their art turned out! 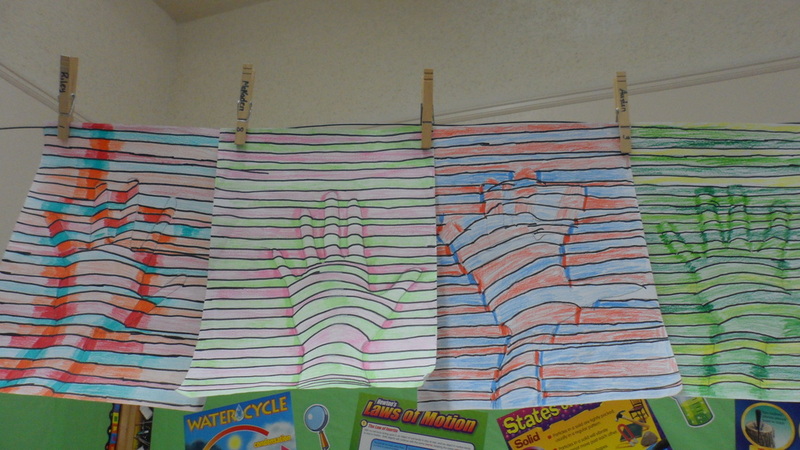 This week we did a little bit of op art. This project was a little tricky for some but I think it turned out great! 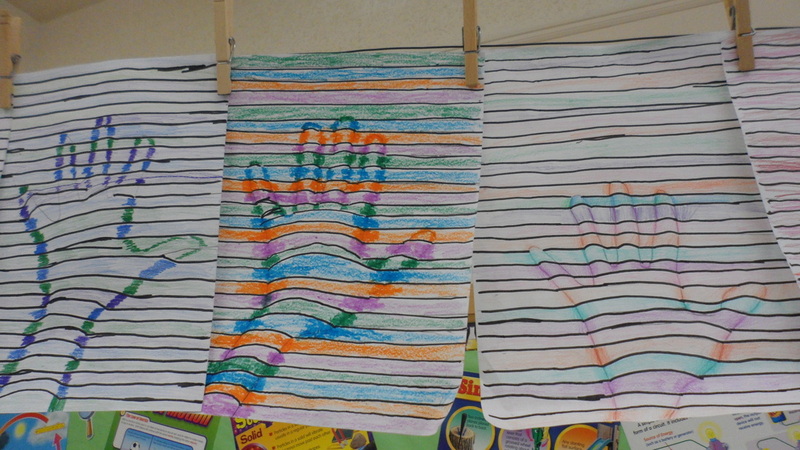 They students first traced their hand and then used a pencil to draw straight lines across. 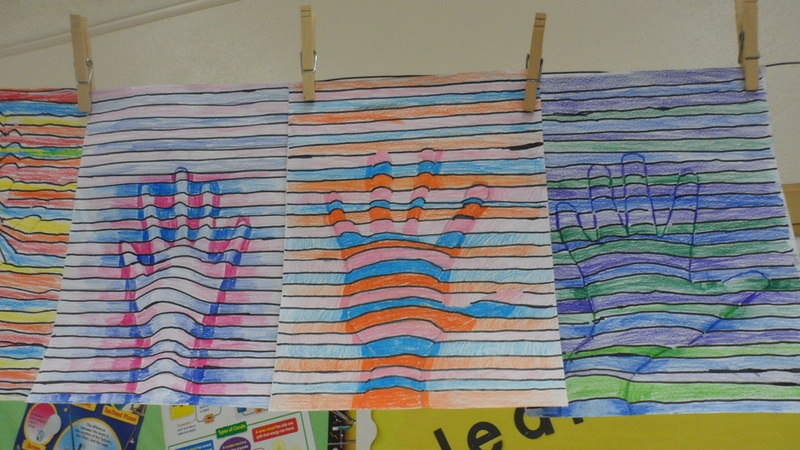 When the line came to their hand or their wrist then they curved the line slightly. 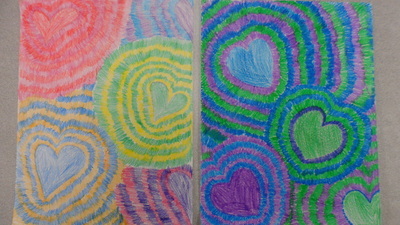 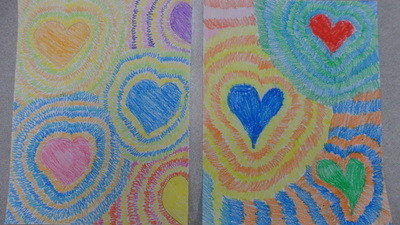 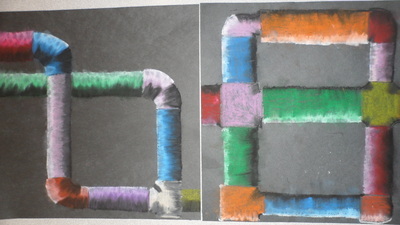 To color this project in we used colored pencils. 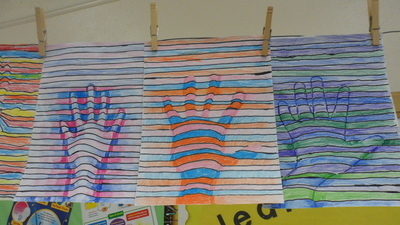 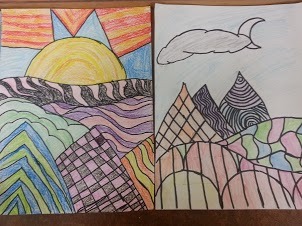 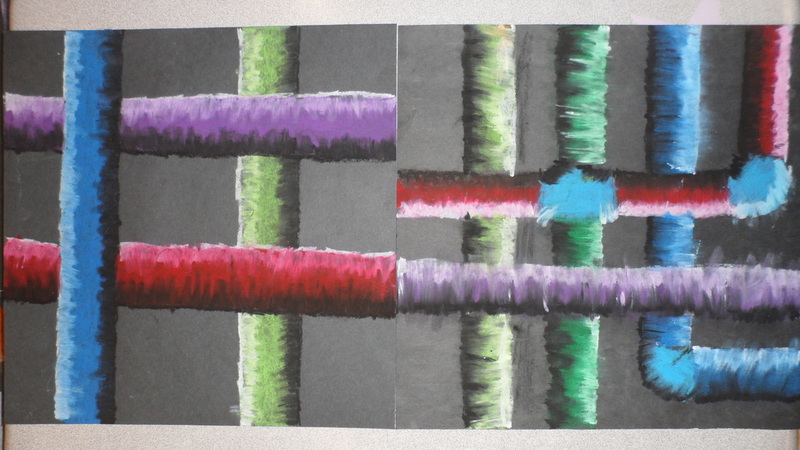 The students were to focus on value in order to make it look like your hand was pushing up through the lines. 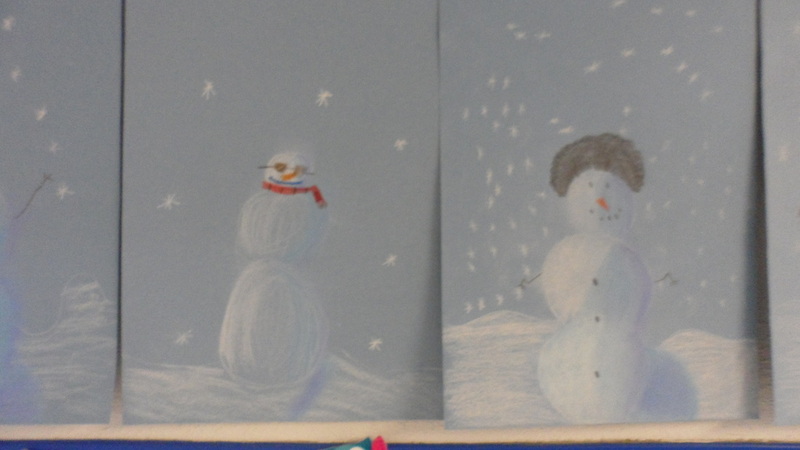 The fourth graders explored value through creating their own snowmen. 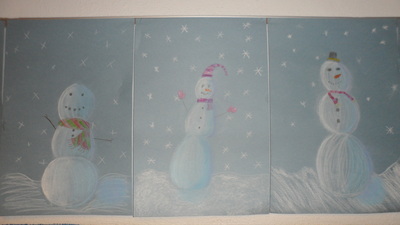 This project was to make the snowmen look more 3D and the typical three white circles. 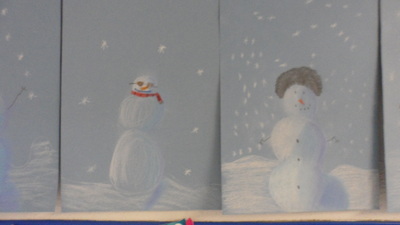 The students also got to add their own accessories to their snowmen which they enjoyed. We did this project step by step together after reading the story Snowmen at work. We used white, blue, and some purple chalk to make the snowman body and colored pencils to make the accessories. 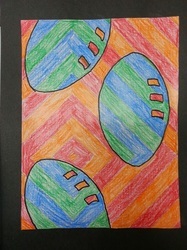 To learn about value, the fifth graders did a project that has gotten many compliments. 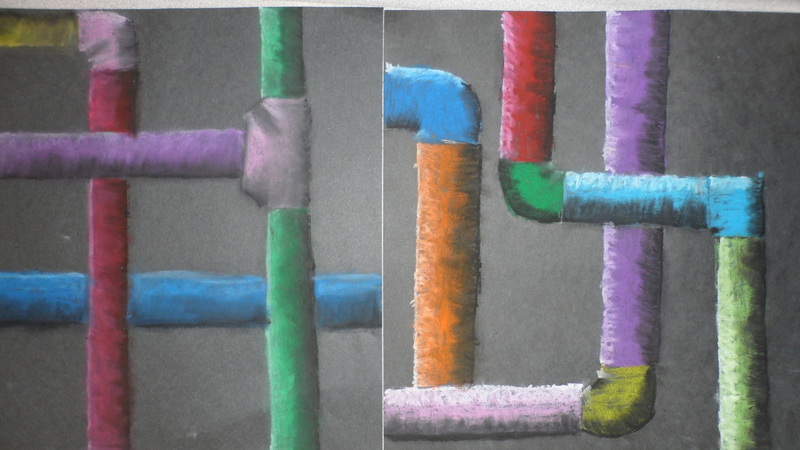 In this project they had to create pipes that would go either vertically or horizontally across the page. 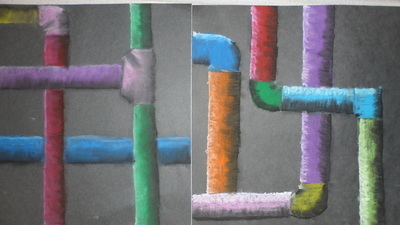 The students could add connectors to their pipes to make them more interesting which they enjoyed. 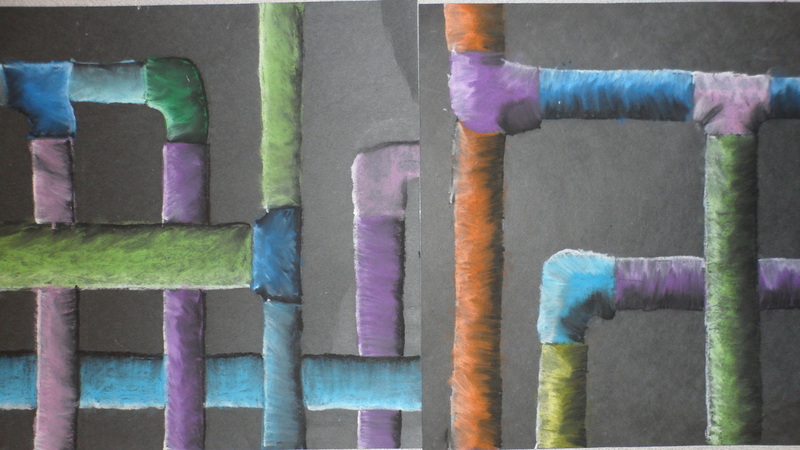 We used oil pastels to color in the pipes and on one side of the pipe the students used white to show where light was coming from and the other side they used black. They blended the white and the black into the colored pipe to give the pipe some value and look round. 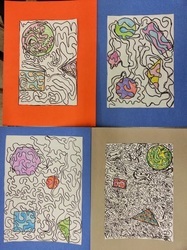 Every single project turned out absolutely amazing! 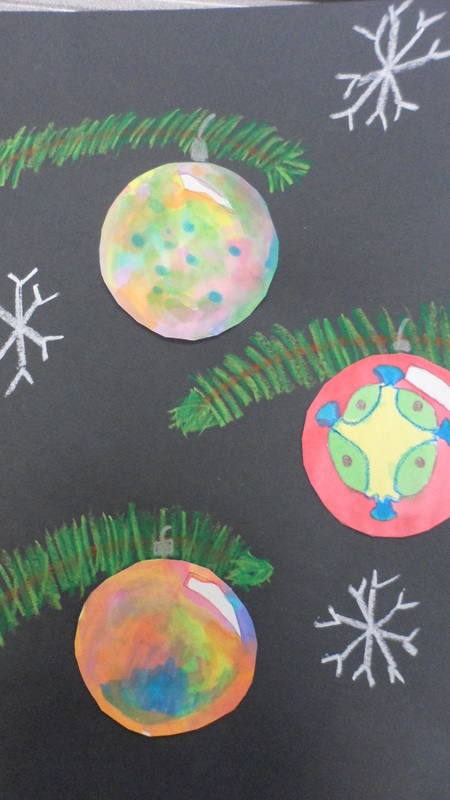 This project was a little bit of science and art all mixed together. 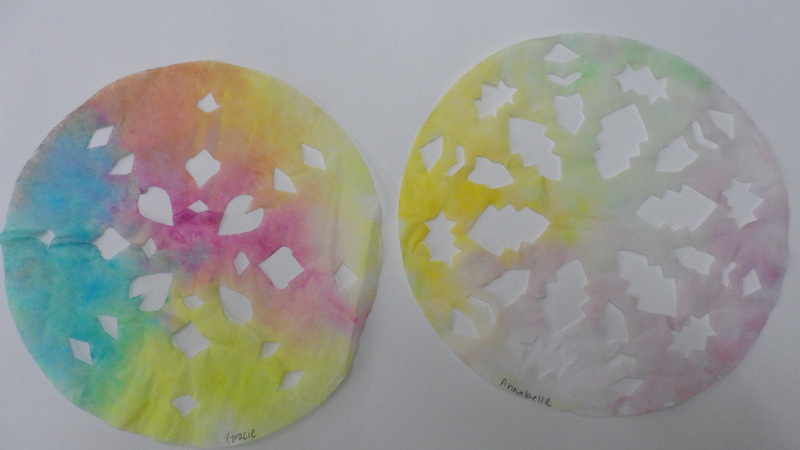 Students watched what happens when liquid soap is dropped in milk. The milk had a couple drops of food coloring in it which made a fun swirling effect. The students used coffee filters to cut their snowflake design and then carefully set them in the milk mixture to die the snowflakes. 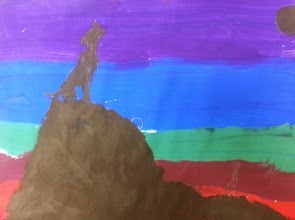 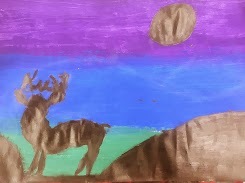 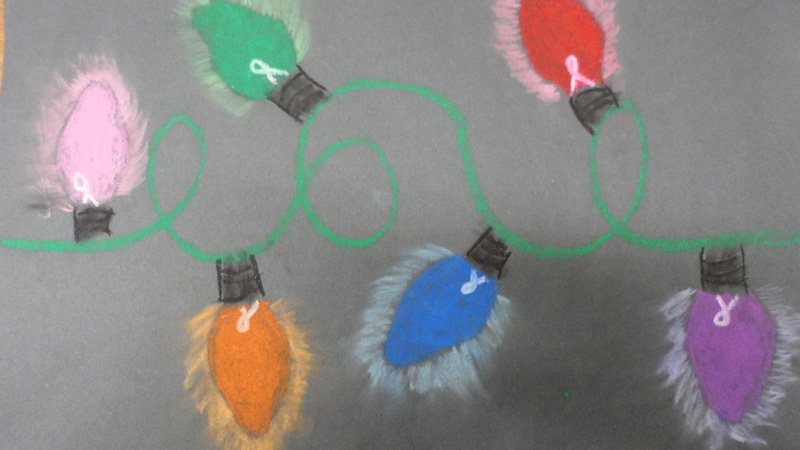 The 4th grades used oil pastels and colored chalk to make this wonderful art work. 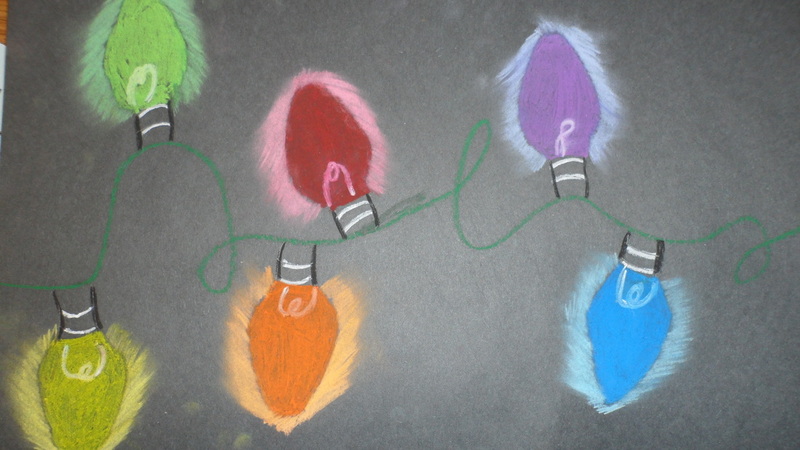 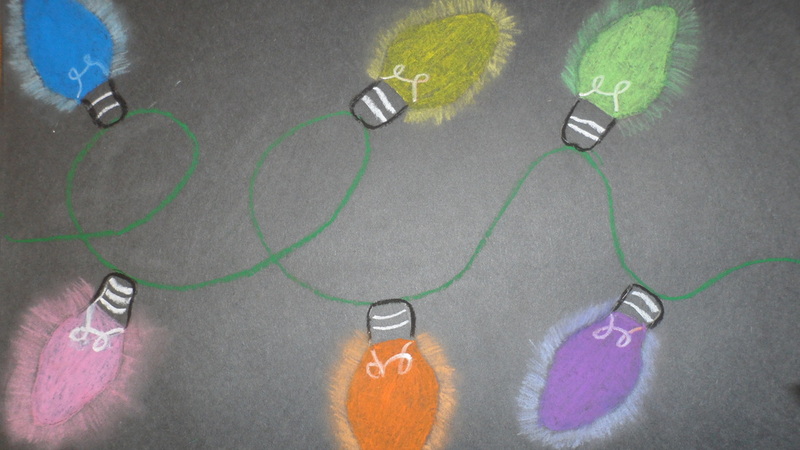 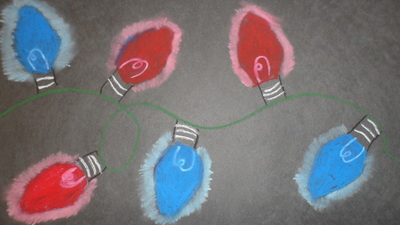 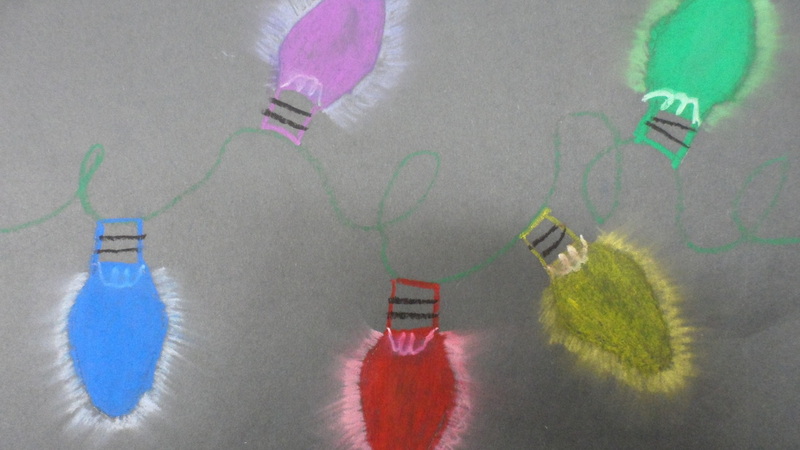 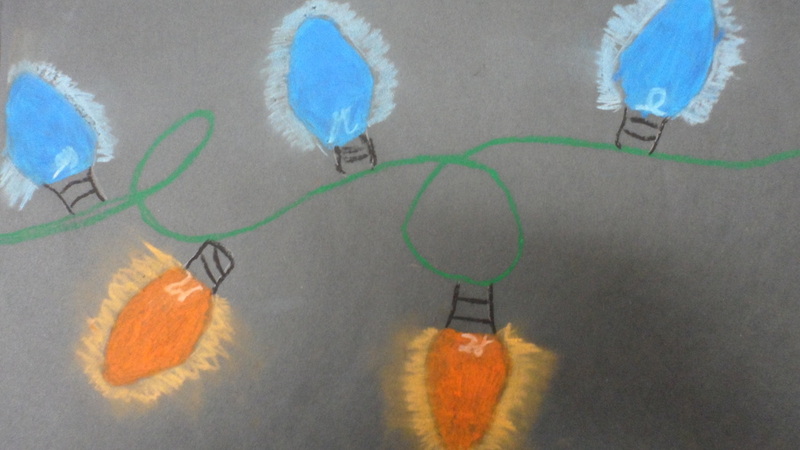 The fourth graders used the oil pastel to color in the bulb and used chalk to make the bulbs look like they were glowing! 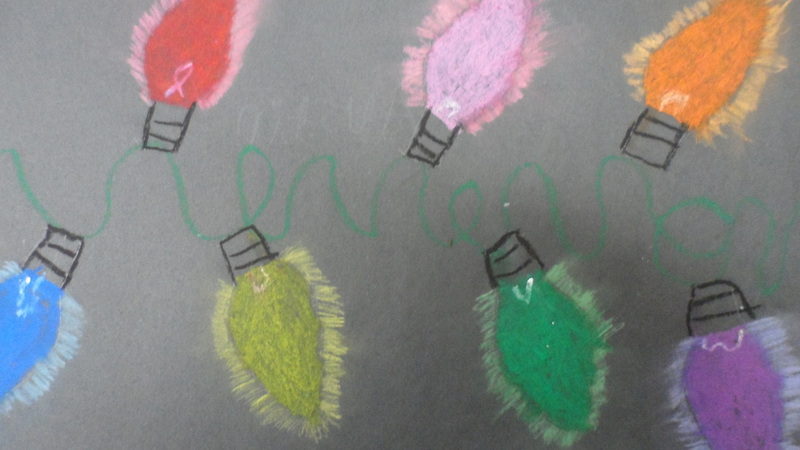 This definitely brightened up our hallway! 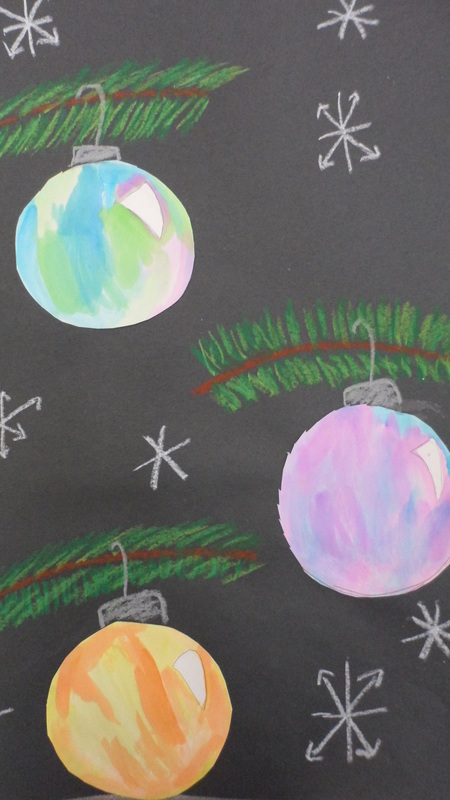 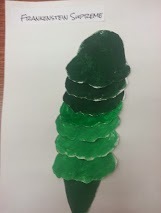 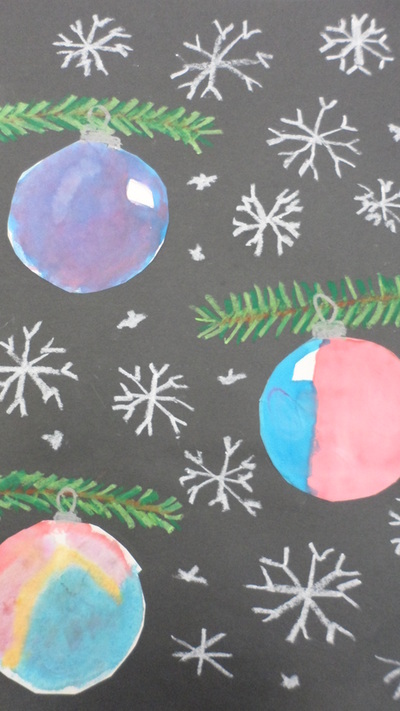 In 5th grade, the students used water color to paint ornaments. 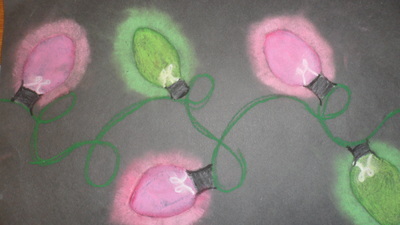 They painted the ornaments to give them a little bit of shine. 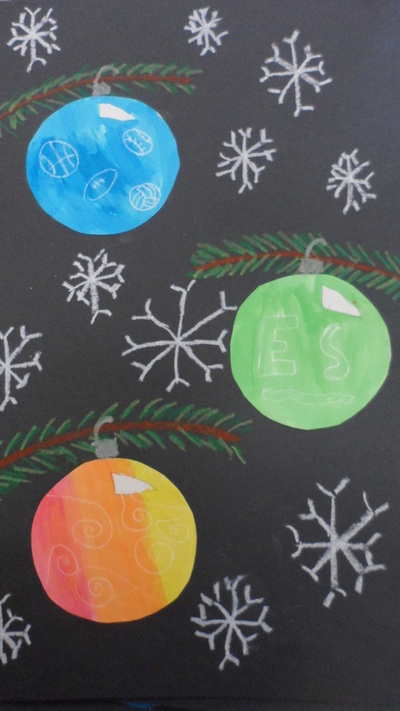 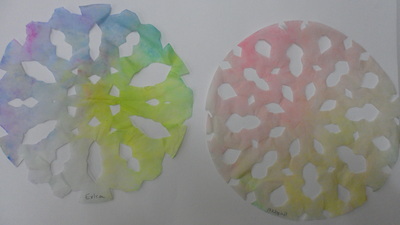 On the background we used oil pastels to draw branches and some snowflakes. 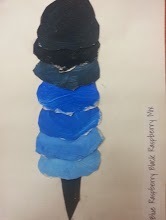 The students enjoyed using all of the different mediums to make this work of art. 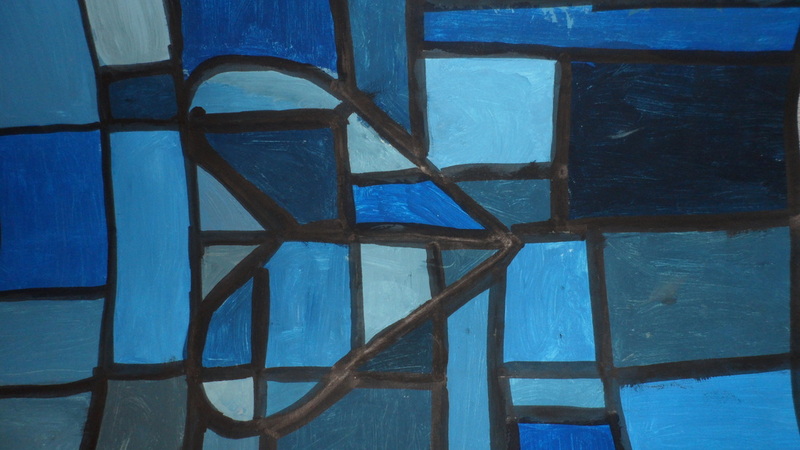 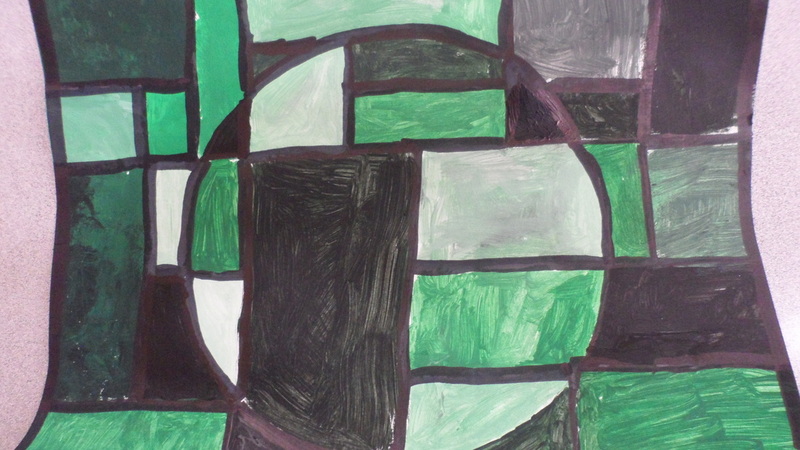 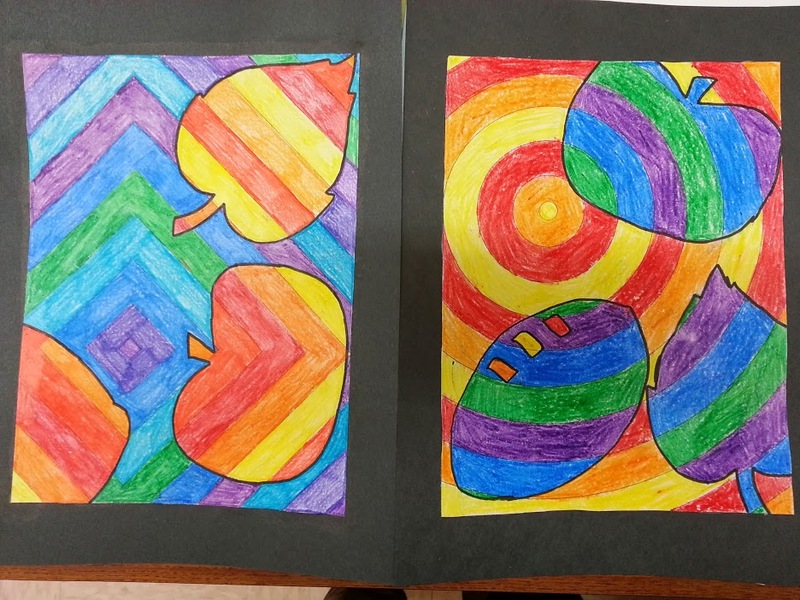 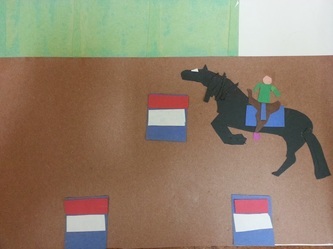 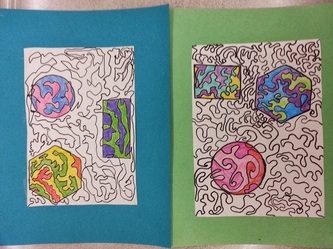 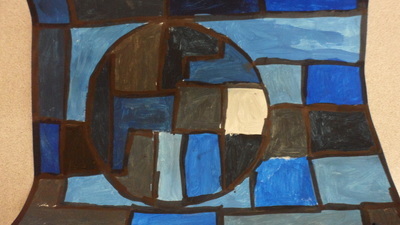 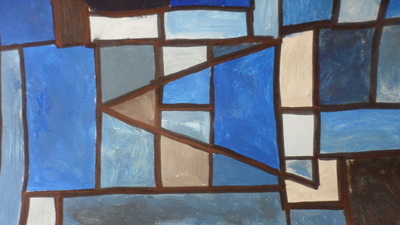 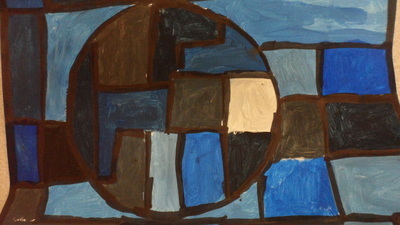 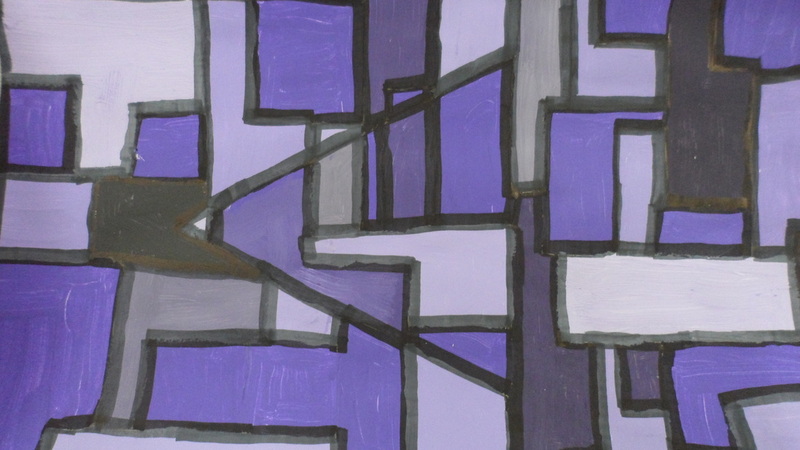 To make this project, the student used a ruler to make straight lines around a shape that they chose. 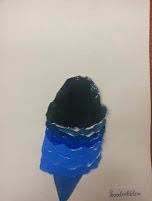 Then they used one color of tempera paint and a little white and a little bit of black paint to mix the different tints, tones, and shades. 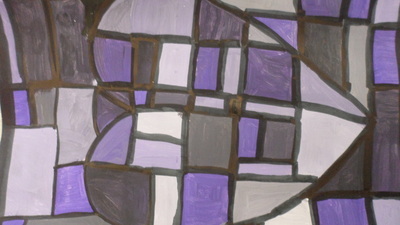 After the painting was dry, we used sharpies to go over our lines to get the stained glass effect. This project the students finally got to work with materials that weren't crayons or colored pencils. 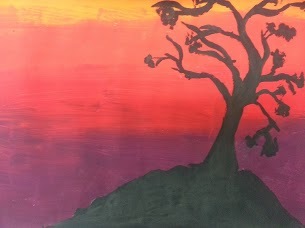 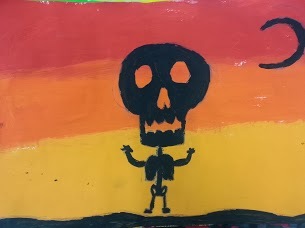 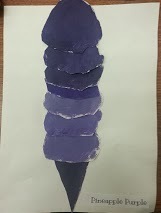 Students had to paint the background of their paper in an analogous color scheme which means three colors right next to each other on the color wheel. 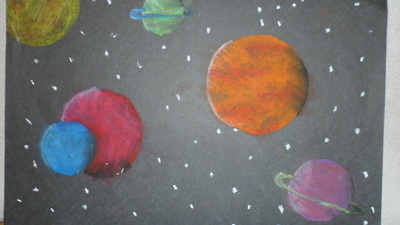 The kids had fun experimenting with the colors and deciding what they would paint on the front. 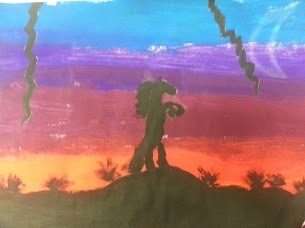 After the background was dry we painted silhouettes in black on the front. 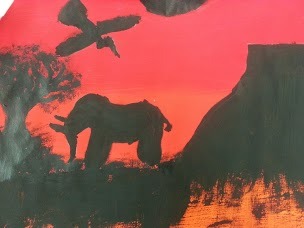 The students were instructed not to put detail into their animals or creatures because it wouldn't be seen once we painted. 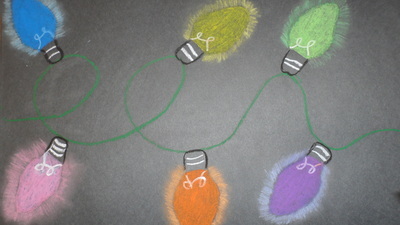 This is one of my favorite projects yet! During this project the students had the opportunity to learn about a new color scheme. 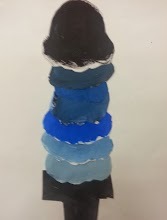 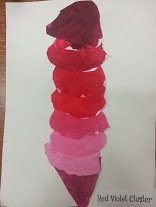 Students learned about monochromatic colors and tints, tones, and shades. 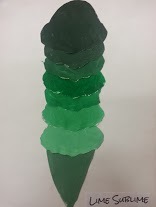 Students made seven scoops of ice cream. 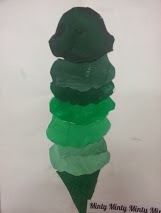 3 scoops had to be tints, 1 scoop with the normal color, and 3 scoops were shades. 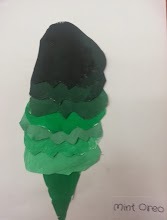 Students had fun mixing colors and seeing what happened when you added just the tiniest bit of black. Everyone had to come up with their own flavor and write it on the back. 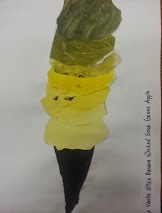 The students kept the flavor name a secret so almost everyone had a unique name. 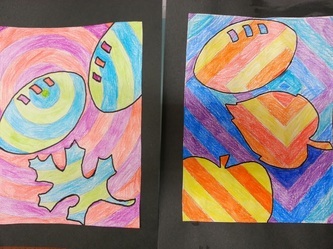 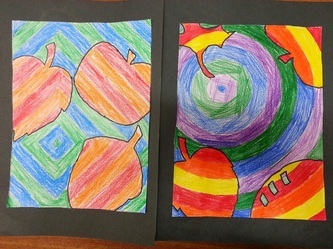 With this project students learned about warm and cool colors as well as complimentary colors. 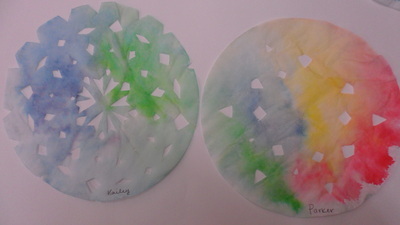 Students got to use the color wheel they made to help them select colors and see what the compliment of that color was. 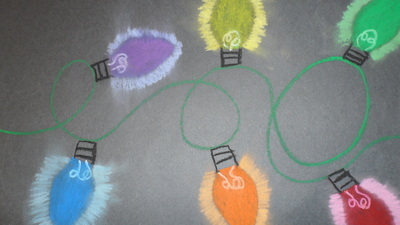 This was a great fall project! This week we combined shape and line to create a wonderful piece of art. 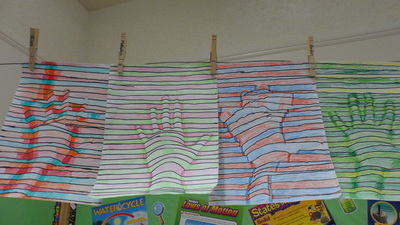 The students had to draw 3 geometric shapes and then start their world's longest line over the shapes. 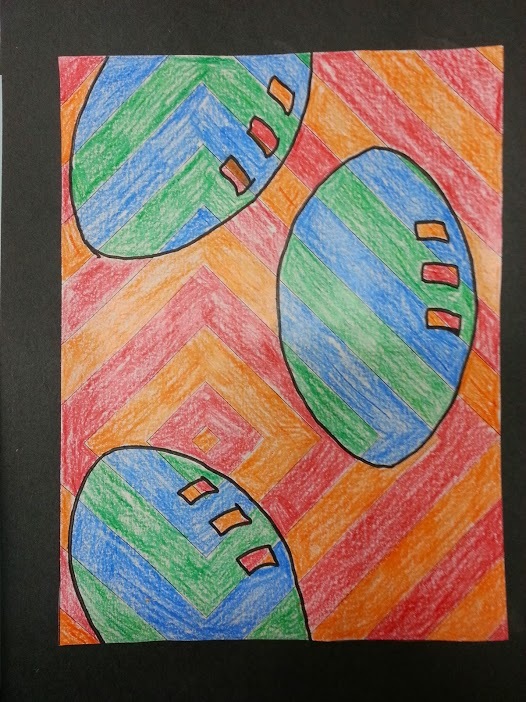 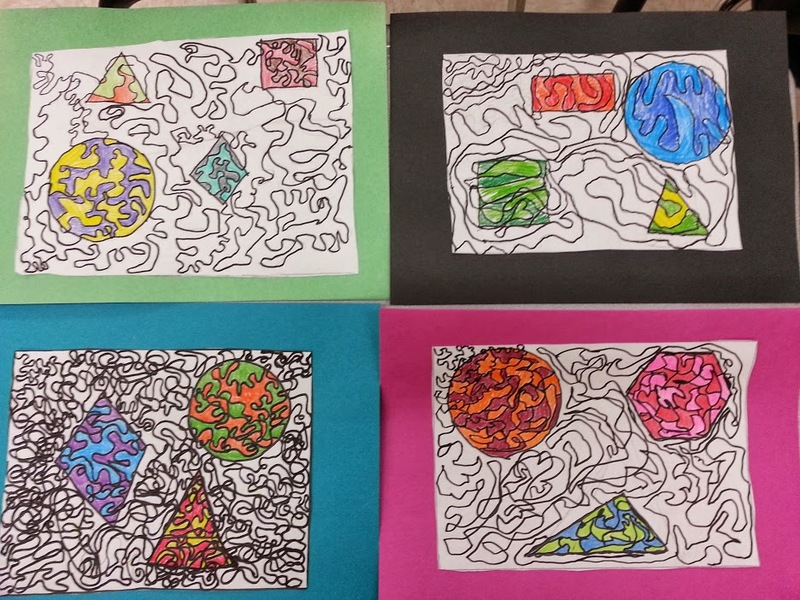 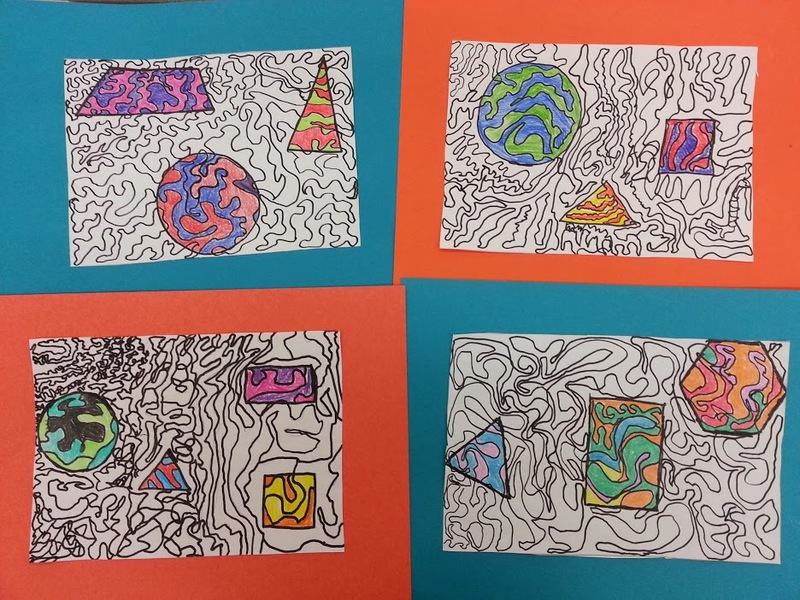 After they completed their line they had to color in the geometric shapes using at least 2 colors. While doing this project the students learned about shape and the difference between organic or geometric shapes. 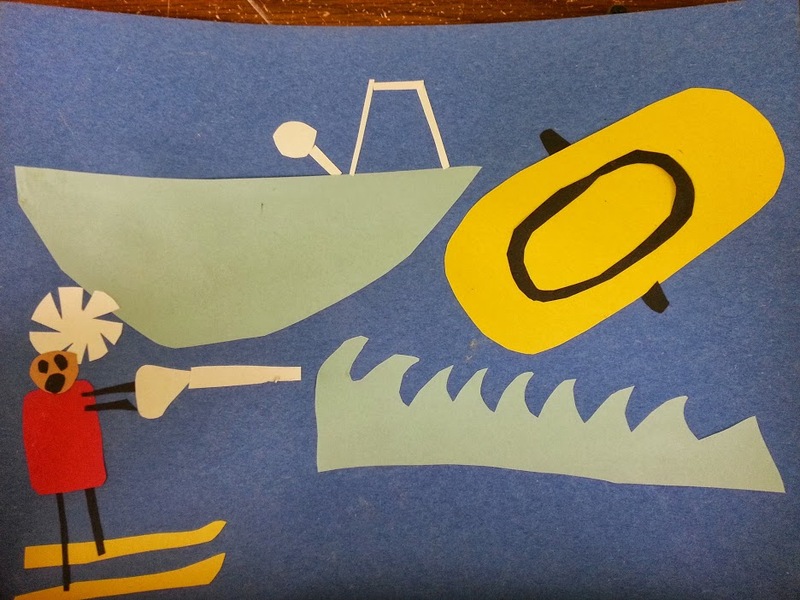 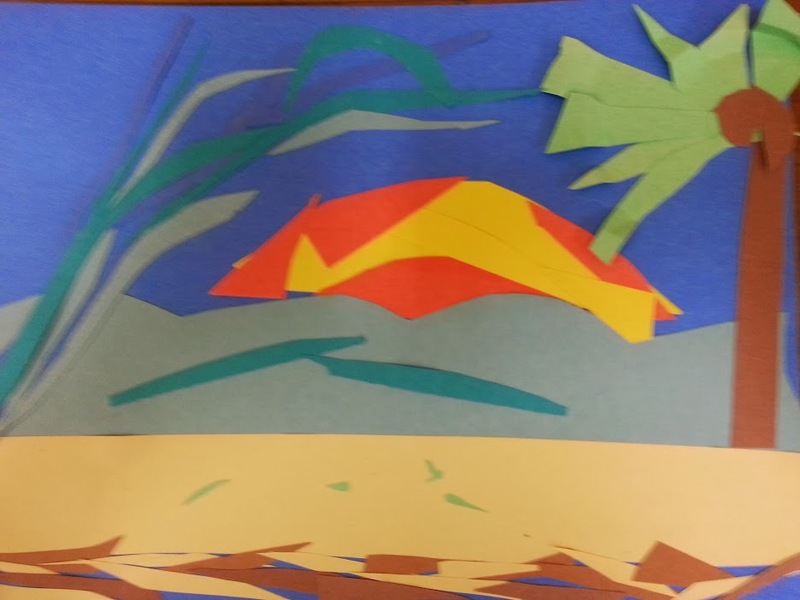 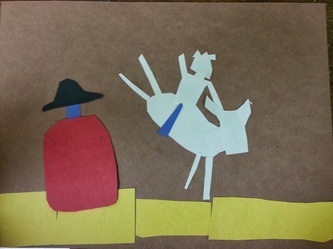 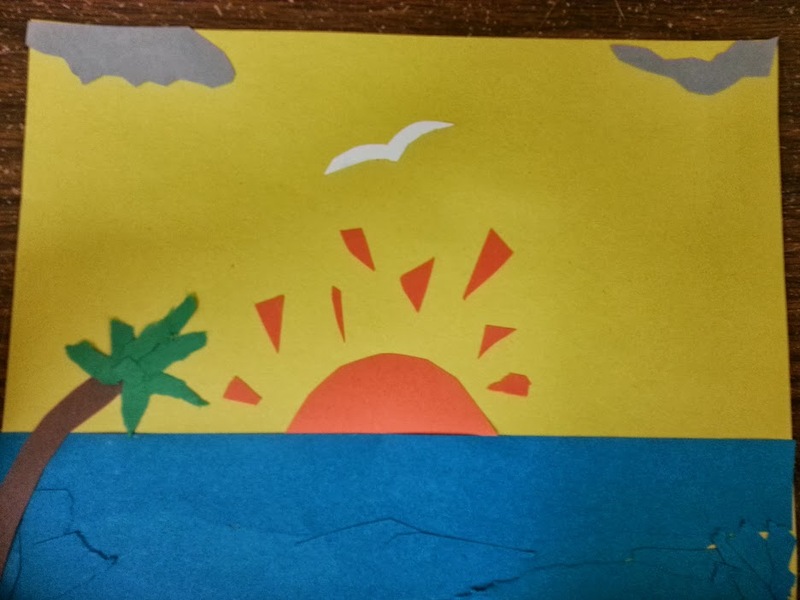 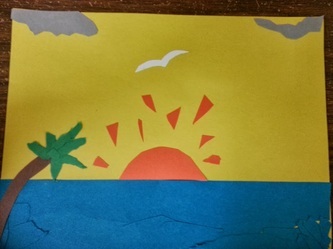 The students were to think of a memory they had and cut everything out of paper and make a collage. 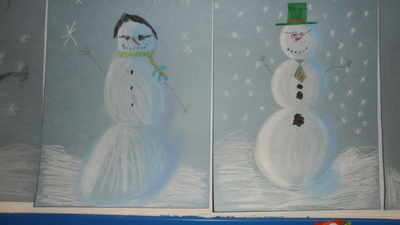 The students were not allowed to draw anything! Everything was made out of paper. 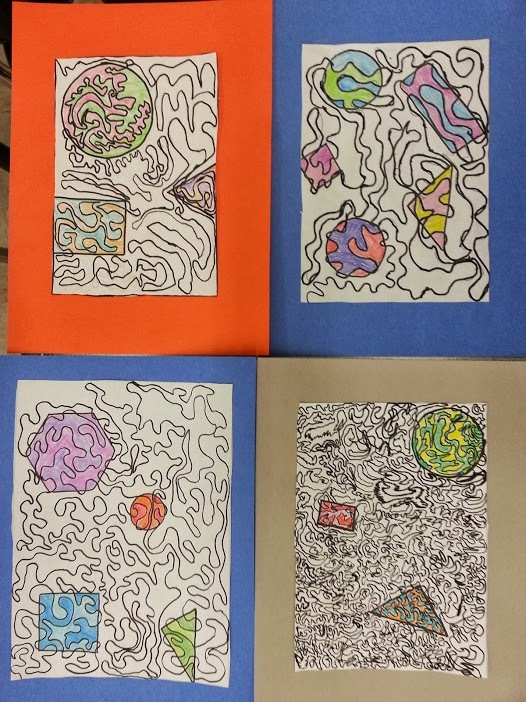 For two weeks we worked on this patterned landscape project. This was a project where we talked about the art element line. 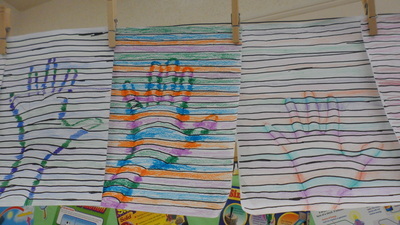 The students learned the definition of line and how different lines could mean different things. 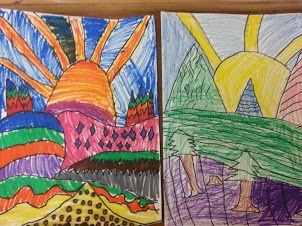 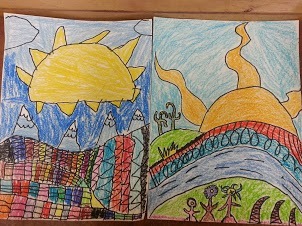 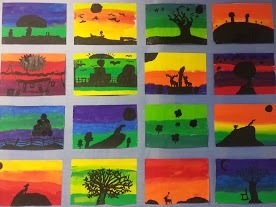 Overall, this folk art landscape project was a great way to start our year in art.